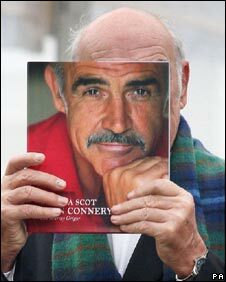 Scottish acting legend Sir Sean Connery has celebrated his 78th birthday by launching his memoirs at a sell-out event in Edinburgh. Sir Sean launched Being A Scot in front of a 300-strong crowd, which included First Minister Alex Salmond, at the Edinburgh International Book Festival. The actor backed calls by the SNP for a separate Scottish Olympic team. He told the audience: "Scotland should always be a stand-alone nation at whatever, I believe." The former James Bond actor also revealed his enthusiasm for US tycoon Donald Trump's controversial plans for a £1bn golf resort in north east Scotland. He told how he met the tycoon in New York soon after the proposals were announced. Connery told the audience: "I said 'Well, I think it's terrific'. "But I had no idea what local repercussions would be. "My first response was I couldn't see anything but benefits for that part of Scotland because it's pretty neglected, apart from the oil fields." Sir Sean joked with the audience about the stick he now faces from Celtic fans since switching his football allegiance to Old Firm rivals Rangers. He said he had been a Celtic supporter when he was younger, after being introduced to the club by his father. He was even involved in a benefit match for their legendary former manager Jock Stein. "Then I changed my allegiance later with (Rangers owner) David Murray," he said. "I met him when I got the freedom of the city here and immediately, we had chemistry. "We enjoyed each other's company - he's an amazing chap and we've stayed very, very good friends since." He added, to laughter from the crowd: "And I get spat on if I go to Parkhead."